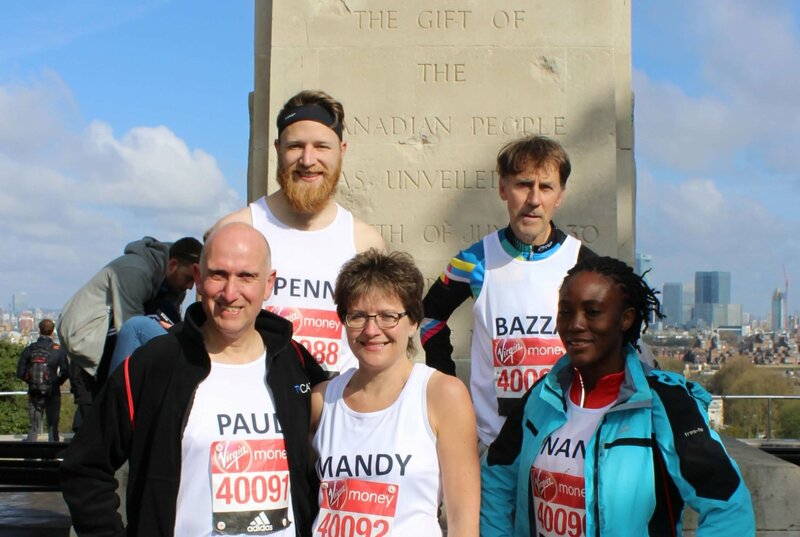 On Sunday April 24th we cheered on our Virgin London Marathon runners: Clare, Nana, Penn, Barry, Matt, Paul and Mandy. All running for International Needs! Nana from Ghana was supported by her company GNPC to come to England to run the Marathon. As Nana completed the 26.2 miles she exclaimed to the crowds cheering “That was so much fun!”. Matt previously ran a 10k charity trail run in Wendover on March 20th to raise funds and encouraged his friends and supporters to come and join him. Matt completed the 26.2 miles in a respectable 4 hours and 17 minutes. Penn Glendinning must be extremely fit as this is his second year of running the Marathon. He even beat his time from last year! In preparation, Barry recently took part in the British Masters Cross Country Championship in Bath. For the marathon itself, he was on track for his target time of 3 hours and 30 minutes when he unfortunately suffered an ankle injury. Despite this, he still managed to complete it in 4 hours and 3 minutes. Clare who had to drop out of last years Marathon owing to an injury was ready for the challenge this year and finished in an amazing 3 hours 49 minutes, she was our fastest runner! Paul and Mandy were running in memory of their daughter Hannah who died last year. Hannah had attended a Go-Global visit to International Needs Ghana and had worked with our team there; we are so inspired and awed by their courage and faith. In Uganda we are aiming to build 20 new wells and 200 latrines for very poor families in the villages around Buikwe and help with the reconstruction of latrines in Ghana. This money plus other donations that people are kindly making to us, will enable us to help reduce water-borne disease in our partner countries. Through schools, we will be supporting families with an ongoing programme of education about good hygiene.